Big. Blue. And easy-to-use. Our Stacking Recycling Bin is the same design used by cities for curbside recycling. Its 12 gallon capacity keeps cartons, boxes and cans contained. Or, stack a couple to make sorting easy. Blue 12 gal. Stackable Recycle Bin is rated 4.7 out of 5 by 20. Rated 5 out of 5 by NewbieOrganizer from Great stackable recycling containers Purchased these in an attempt to organize our garage and our recyclables. I especially like how you can stack these containers on top of each other so it is great for smaller spaces and they are pretty sturdy. In addition, my curbside pick off does not take glass so I have to take my glass to a recycle drop off location and these recycle containers have the handles on the side so it makes them very handy to carry. I purchased two of these one for glass and the other for aluminum cans. I have had them for a couple of weeks and they fir perfect in my small garage space, are very convenient, and very sturdy when stacked. I would definitely recommend these containers! Rated 5 out of 5 by JunieBee from Good Purchase I first ordered six (6) of these bins, just to try them, and then ordered six (6) more. They have eliminated the cluttered look of mismatched receptacles in my garage, i.e. trash cans, cardboard boxes, etc., and, so far, they're working out just fine. We have to take our recycling to a recycling center where we pay by the truckload, so we wait as long as we can to take it. Having 12 bins allows for accurate sorting and they will be easy to pick up and load on our truck. Rated 5 out of 5 by Centralgirl2010 from Ideal setup for my kitchen These stacking bins are easy to stack on top of each other and store quite a bit of recyclables. It is also easy for me to take them down again when I have to go to the recycling center. They are very sturdy - so believe it when they say that they're rugged. The only thing I would change is that I would like it if the openings between the bins were a little bit bigger because that would make adding recyclables to the bin a bit easier, but I crush my plastics anyway and keep the cardboard bin at the top of the stack. 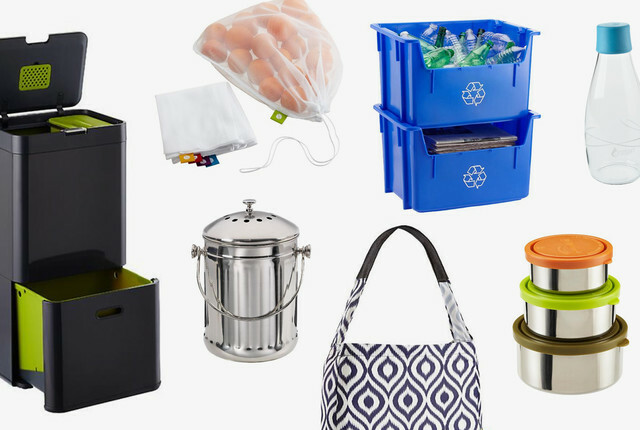 I would strongly recommend these bins to anyone - especially if you have limited space. Rated 5 out of 5 by SusanMarie from Right choice for recycling These recycling bins are exactly what I wanted in a sturdy, space-saving container. Looked at many others, but the stacking feature was key. Reasonably priced for an item I know will last. Rated 5 out of 5 by Golfer0702 from Best Recycling Bins These bins are perfect for any garage. They do not require a lot of space and stack easily on top of each other. We have ours 3 high and can access each one with ease. I would recommend them to anyone looking to recycle any volume of materials. Rated 5 out of 5 by missvang37 from Best Purchase Ever! It great Products use it to recycle my paper and milk container and water bottles even small card box. i love it. Rated 4 out of 5 by rls3 from Recycling Bins I looked for a long time and these were the best I found. I love the size. I would suggest that in the future there should be a bigger gap between the bins as you stack them. I bought three and it isn't easy adding larger items to the lower bins. We have to separate our recycling into cans, glass and plastic. If I have to add a larger item to the bin, I have to unhook them to get the item through the gap. Rated 5 out of 5 by colleenmarie3701 from We needed a recycling bin in our new apartment and this was great. Rated 5 out of 5 by 1Girl1GuyAnd2Cats from Great Product We are super happy with our purchase. They are very efficient and fit perfectly in our pantry. Holds way more than we realized, and will prevent us from having a constantly overflowing "recycle trash can." Recommend to anyone! Rated 4 out of 5 by loopyluna from Sturdy, quality product These bins are a good size for small business or household use. They stack easily but can also nest in case you need to put them away. Very sturdy. Rated 4 out of 5 by Jeezy from Great for our Office I purchased three of these for the office to replace our old system, which was cardboard boxes overflowing with paper and trash (rather unsightly). These boxes really clean up the space and make a big difference aesthetically. I have also noticed that my coworkers have been recycling more materials than they used to. I wish the bins were a bit wider so we could stack broken down boxes in the bottom bin. Bigger boxes we have to fold up and stuff in there, which wastes some volume. Rated 5 out of 5 by Bandersontx from Very Pleased With Bins After enduring a couple of recycling systems which fell short of our needs, I shopped for bins with three criteria on mind: 1. Size. I wanted bins which would be large enough to hold at least one-week's worth of recyclables, but still small enough to easily carry and fit in my car. (Our last system was way to large and bulky.) 2. Sturdiness. No more wimpy bins! 3. Easy access. Our center's home is in our pantry, and the bins sit on shelves. We wanted bins with an opening in front, so it's easy to drop items in, and we can see how full the bin is with a glance. (The bins stack nicely, although we don't utilize that feature.) These bins fit all three criteria! We 're very pleased! Rated 5 out of 5 by ajbd from Perfect Fit Exactly what I was looking for. Looks great. Shipped well and quickly. Good quality! Not disappointed. Rated 5 out of 5 by MrCanMan from The Blue Recycler A great good looking bin with better than average storage capacity that stacks high and tight. Rated 5 out of 5 by tracyd222 from Wonderful! These recycling containers are sturdy and store rubbish wonderfully! Rated 5 out of 5 by SandT from Easy way to Contain Recyclables! These containers make it easy to contain recyclables and are very easy to take to and from the curb! What is the exact height of two of these stacked? What are the width and depth dimensions of the bottom of the recycling bin? Do these recycling bins taper to smaller dimensions at the bottom? Will the bins fit on an open shelf that is 14&quot; depth with a 1&quot; lip? When the bins are staked how large is the opening? If we have them stacked can you easily put bottles and steel cans in the bottom bin? Approximately 4.5&rdquo; by 14&rdquo; (bottom edge) or 16&rdquo; (at top edge). What is the country of origin of the Blue Stacking Recycling bin? The country of origin for this product is Canada. Are there liners available for this recycling bin? While no liners are available for this recycling bin, we do offer simplehuman Recycling Bags which can be used to transport recyclables once the bin is full. So far I've only been able to get these to nest, how do you get them to stack on top of each other as shown in the product photo? These should be able to stack only and not nest. Please contact us with pictures of your bins via email at contain@containerstore.com for further assistance. What are the outside dimensions of each bin? The external dimensions of our Blue Stacking Recycling Bin are 20-1/4&rdquo; x 15-1/4&rdquo; x 12-1/4&rdquo; h.
What is the weight of the recycling bin? My county requires me to provide my own bin for recycling plastics. The last 3 bins I have used have been blown away during strong windstorms. I would like to know if the weight of this blue bin is equivalent to the heaviness of the recycling bins that are provided by the recycling companies since they do not blow away. Our Blue Stacking Recycling Bins each weigh approximately 3.5 pounds.